This image of a southern mid-latitude crater was intended to investigate the lineated material on the crater floor. 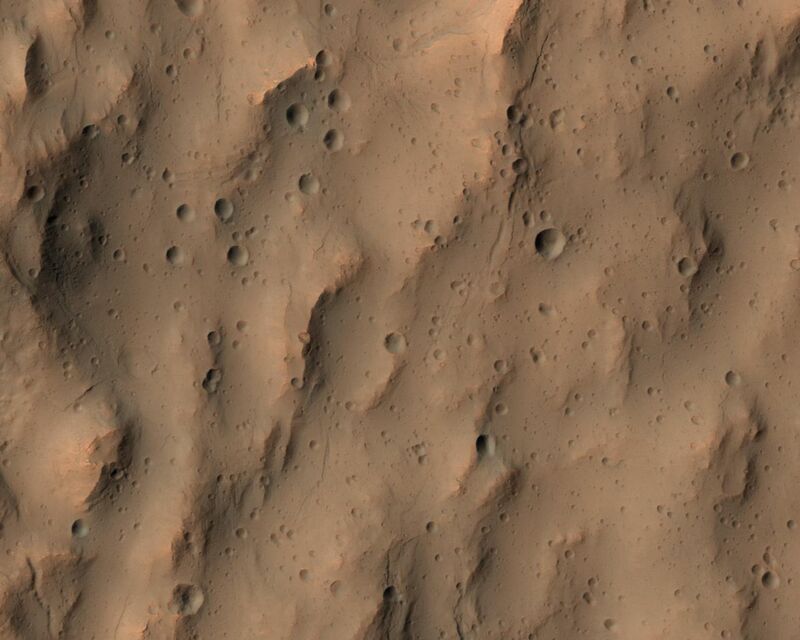 At the higher resolution of HiRISE, the image reveals a landscape peppered by small impact craters. These craters range from about 30 meters in diameter down to the resolution limit (about 2 meter diameter in this image acquired by averaging 2x2 picture elements). Such dense clusters of small craters are frequently formed by secondary craters, caused by the impact of material that was excavated and ejected from the surface of Mars during the creation of a larger nearby crater by the impact of a comet or an asteroid. Secondary impact craters are both interesting and vexing. They are interesting because they show the trajectories of the material that was ejected from the primary impact with the greatest speeds, typically material from near the surface of the blast zone. Secondary craters are often found along the traces of crater rays, linear features that extend radially from fresh impact craters and can reach many crater diameters in length. Secondary craters can be useful when crater rays are visible and the small craters can be associated with a particular primary impact crater. They can be used to constrain the age of the surface where they fell, since the surface must be older than the impact event. 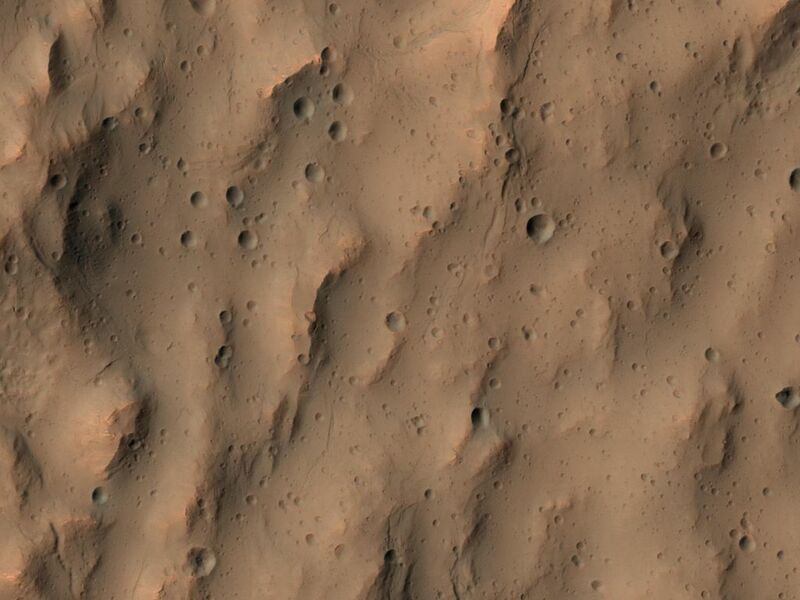 The age of the crater can be approximately estimated from the probability of an impact that produced a crater of such a size within a given area of Mars over a given time period. But these secondary craters can also be perplexing when no crater rays are preserved and a source crater is not easily identifiable, as is the case here. The impact that formed these secondary craters took place long enough ago that their association with a particular crater has been erased. They do not appear along the trace of a crater ray that is still apparent in visible or thermal infrared observations. These secondary craters complicate the task of estimating the age of the lineated material on the crater floor. It is necessary to distinguish secondary craters from the primary impacts that we rely upon to estimate the ages of Martian surfaces. 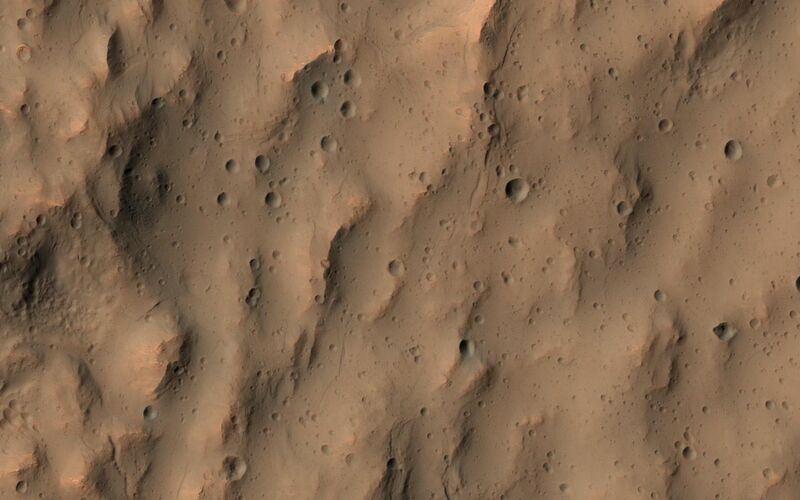 The large number of small craters clustered together here is typical of crater rays elsewhere on Mars and suggests that these are indeed, secondary impact craters.